Matthew Price (R), an apprenticeship instructor with the North Central States Regional Council of Carpenters, led a crew of union apprentices in framing the interior of an airplane hangar at the St. Paul Downtown Airport. 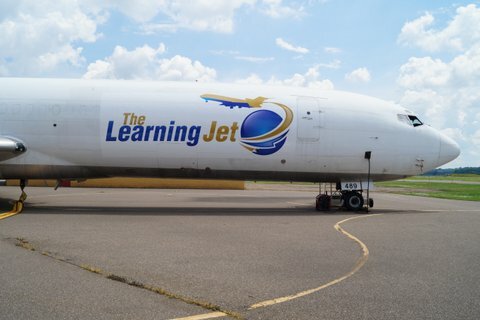 The Learning Jet has been wowing kids since the cargo plane-turned-classroom opened at St. Paul’s Downtown Airport two years ago. The facility’s portable restrooms, on the other hand, have drawn a much different reaction. That will change when the Learning Jet’s expanded space opens next spring, thanks in part to volunteers and apprentices from area Building Trades unions. They are renovating a nearby airplane hangar with a kitchenette, classroom space and, yes, indoor plumbing. Work began on the 3,400-square-foot hangar in September. Some unions sent volunteers, while others, like the Carpenters union, made the project part of their apprenticeship curriculum. Matthew Price, a carpentry instructor for the North Central States Regional Council, led a crew of eight apprentices in framing the hangar’s walls last month. Apprentices Alex Brown (R) and Ron Schuster. Carpentry apprentice Daniel Swanson worked atop scaffolding. Carpenters union apprentice Daniel Swanson (L) and instructor Matthew Price worked together. Plumbers Local 34 volunteers Tony Tietje (L) and Mike Danley. Union volunteers poured concrete for a new floor in the Learning Jet hangar. Pictured (L to R) are Chris Peltier of Laborers Local 563, and Brian Farmer and Brian Gullickson of Cement Masons Local 633. Carpenters union apprentices Dustin Monson (R) and Daniel Swanson installed the hangar’s new ceiling. Other unions that provided support to the Learning Jet project – or committed to doing so – include Bricklayers and Allied Craftworkers Local 1, Cement Masons Local 633, Heat and Frost Insulators Local 34, International Brotherhood of Electrical Workers Local 110, Laborers Local 563, Plumbers Local 34, Roofers Local 96, Sheet Metal Workers Local 10 and Sprinklerfitters Local 417. “I wouldn’t doubt there might be more locals to sign on at some point,” said Dean Gale, a business representative with St. Paul Plumbers Local 34 who is coordinating work on the project. Several unions have partnered with their signatory contractors to provide building materials for the project, he added. When finished, Gale said, the refurbished hangar will have new flooring, heating, plumbing, ventilation and more, at a value of about $250,000. Hurvitz plans to house two small aircraft in the hangar, as well as at least one flight simulator. But the big draw at Holman Field remains the Learning Jet, a Boeing 727-200 retired by FedEx and repurposed into a classroom. Students from kindergarten through high school take field trips to the Learning Jet, which has tailored a curriculum for each grade to enhance the experience. That’s how Building Trades apprentices learn as well – a connection not lost on Gale and other union leaders. 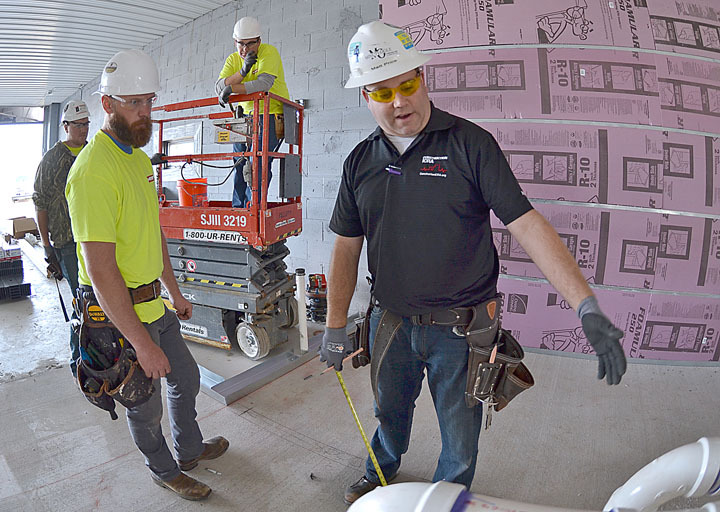 Minnesota’s strong technology sector, Gale added, provides Building Trades union members with a steady stream of work, as firms build, remodel and upgrade their facilities to keep up in a rapidly changing field. Unions aren’t the only organizations supporting the Learning Jet. The Metropolitan Airports Commission has been a critical partner since long before the jet arrived at Holman Field, Hurvitz said. He credited Home Depot, York Air, United Rental, Kirtland Electric, Kraus-Anderson Construction and RRTL Architects for their contributions to the hangar as well.